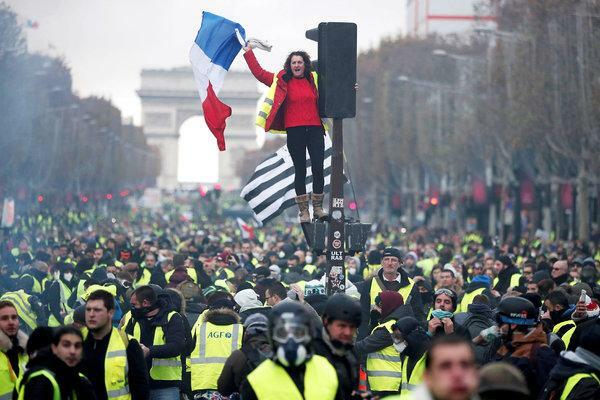 Saturday December 15 marked the fifth consecutive week where thousands of people have held marches and engaged in various forms of civil disobedience throughout France. Sparked by the imposition of a fuel tax, the “gilet jaunes” (Yellow Vest) movement has exposed the negative impact of the neo-liberal policies of the ruling La Republique en Marche President Emmanuel Macron. Even after the president announced the suspension and eventual elimination of the fuel tax along with other reforms related to minimum wages and pensions, demonstrations still took place the following week albeit in smaller numbers. These political developments which are influenced by the economic crisis gripping the western capitalist states could result in both rightward and leftward tilts in the character of the responses by the working and middle classes. Nonetheless, the adoption of a purported “populist” stance on the failure of the neo-liberal governance model provides no solution to the majority of working and oppressed peoples within the capitalist countries. Western industrialized nations are experiencing limited growth rates with a widening gap between the rich and poor. Attacks on migrants and the nationally oppressed cannot guarantee higher wages and better living conditions for the previously more stable working and middle classes. Imperialist wars in the last three decades in Iraq, the Balkans, Afghanistan, Libya, Syria, Yemen and other geo-political regions have drained the national wealth of the western countries. The global recession after 2007 and the large-scale governmental bailouts of the international financial institutions along with the industrialists have further weakened the social fabric of world capitalist system. Only a movement to genuinely empower the workers and oppressed on a non-capitalist basis provides the potential for moving beyond the present crisis in Europe, North America and the rest of the world.